This lonely dog is so desperate to find a forever home, he's willing to do whatever it takes to show just how nice a housemate he would be. It's hard to imagine just how sad it must feel to be languishing in an animal shelter hoping to become someone's cherished pet, but Rush the pit bull apparently found a way to cope until that day comes. Staff at the Society for the Improvement of Conditions for Stray Animals (SICSA) in Kettering, Ohio, say the 1-year-old pup has developed a sweet little tradition to make his cold kennel a little cozier. "[Rush] makes his bed every day at an animal shelter while he waits for a family to adopt him," SICSA wrote on Facebook. "He's been waiting for over 30 days." Rush first arrived at the shelter when he was just a puppy, originally rescued as a stray. While his skills at bed-making have already endeared him to hundreds of animal lovers online, he's still yet to find what he needs the most - a bed of his own, in a home with a family who loves him. 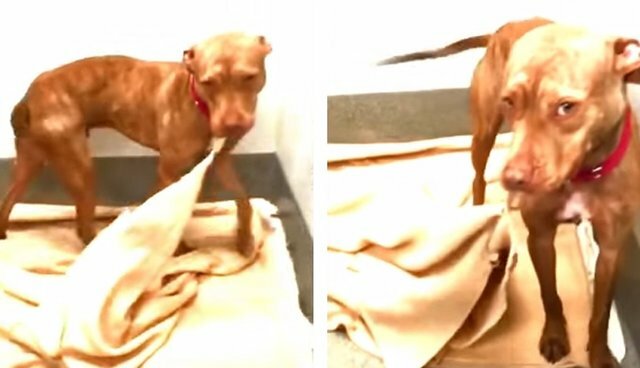 Rush, a homeless Pit-bull, has been making his bed every day while he waits on a family to adopt him. He's been making his bed for 30 days. Let's find him a family; watch here: https://youtu.be/_WqtFk9O8WE. To learn more about Rush and other adoptable pets, visit the SICSA's website here.